Nintendo is taking its Wii U to the Sundance Film Festival. Nintendo already has the theme tune, so all it needs is a venue to show off the Wii U's star power. What better venue than the Sundance Film Festival? That's where Nintendo intends to show off the entrants to its 48 hour Wii U Video Challenge, held just a few days ago. 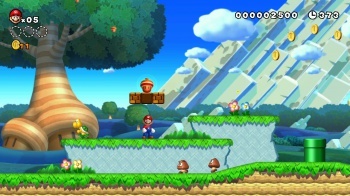 YouTube filmmakers were asked to participate in the Video Challenge, creating New Super Mario Bros. U films that showed off the capabilities of Nintendo's latest console. Twelve of those participants were selected to show off their work at Sundance; the finalists were split into groups of four, to create three Wii U films. These short subjects will be screened for the first time on January 17th, in front of film industry people, Nintendo executives, and other important folks, all of whom will get to vote on the final champion. Sundance, Robert Redford's independent film incubator, maybe isn't the first place the gaming industry would think of to host an event, but Nintendo's clearly aiming high. In addition to the film event, Nintendo also intends to show off as yet unreleased Wii U games at its Sundance Lounge, according to the Hollywood Reporter, so if you happen to be in or around Park City, Utah, and fancy a look at Nintendo's latest, why not wander over and take a peek?